On Oct 8, 2015, a completely unknown company announced a new camera which promised to change how we think about photography. The L16 combines breakthrough optics design with never-before-seen imaging technology to bring you the camera of the future. The L16 would use 16 camera modules with varying focal lengths with folded optics instead of 1 single sensor, and use “computational photography” to fuse the individual photos together with depth data, producing results that would be “DSLR quality”. The marketing promised a unicorn camera that prosumer/enthusiast photographers like me would want to carry around as an every-day tool. In theory, I would be able to leave my traditional cameras behind — today a FujiFilm X-T2, Leica Q and Sony RX100mk5 — and travel with just the Light L16. 2 years and 1 day after I pre-ordered my camera, my Light L16 finally arrived. Two years ago, Light announced L16: a weird-looking camera that looks somewhat like smartphone, but captures DSLR-quality photos. It combines 16 lenses of three focal lengths to create 52 MP photos. If you were wondering what the photos captured with this strange device would look like – the answer is here. Light publishes the gallery of photos taken with the L16 camera. There are three high-res images, ranging from around 53 to as much as 81 MP. You can view them or download them, and they’ll give you a pretty detailed insight of the camera’s capabilities. The Light L16 is a unique oddity amongst cameras. If you’ve never heard of it before, it uses an array of 16 cameras and lenses to create “DSLR quality in the palm of your hand”. Whether that claim is true or not remains to be seen. But see we will, and quite soon now. First announced in October 2015, Light L16 will enter into its Expanded Beta phase in May, with pre-orders starting to be shipped in July. Thanks to our friends at Light Rumors, we also get to see the first product images of the final production camera. It’s had a little bit of a redesign from the original shown in 2015, and more closely resembles the prototypes we saw in a video last July. Since debuting the Light L16 last October, it’s a product that many have been following with interest. Some see it as an interesting concept that’ll probably end up being vaporware, while others can’t wait to get their hands on it and see what it may hold for the future of photography. The latest round of announcements from Light show that the L16 is well on its way, and will actually feature a couple of improvements over its initial spec sheet, including more storage and a wider focal range. 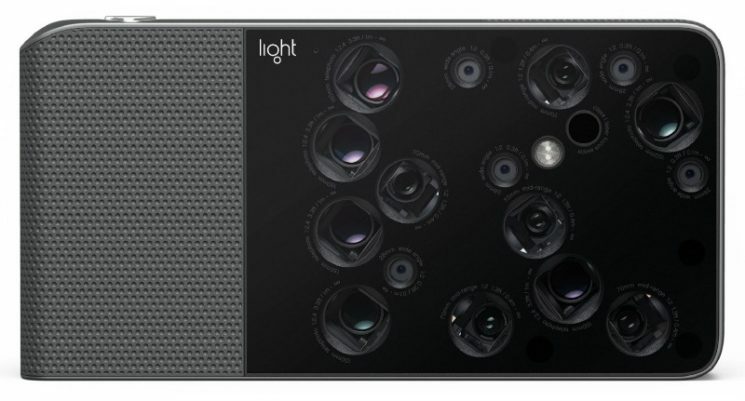 Light, the company behind the Light L16 camera which contains 16 sensors and lenses, has announced that they’ve teamed up with Sony to create the next generation of multi-camera smartphones. Well, we knew Light was working on something to do with phones, and now it looks like it’s official. Ever since the first triple camera phone was launched, it looks like the competition has started among smartphone manufacturers: who’s gonna make a smartphone with more cameras? According to a recent report, LG is currently in the lead, at least in theory. The company is reportedly making a phone with 16 cameras. Not four, five, six or nine. Sixteen! Well, it can be yours for $29,999 plus $155 shipping, anyway. But the shipping’s practically a bargain. We often hear about those “rare” lenses popping up on eBay and various other places, but this one does appear to actually be pretty rare. It’s a Canon 45-200mm f/2.8 (C35) prototype lens, and the seller claims it’s never been sold before in the “whole eBay selling history”.